Window Awnings | ShadeMaker Products Corp.
ShadeMaker Window awnings are a great way to dress up your trailer and provide shade. They are available in vinyl trilaminate fabrics which match our roll up awnings and awning replacement fabrics (re-covers). Window awnings sizes range from 36" through 108" in six inch increments. Awning size represents the center to center measurement of the awning arms. The minimum possible width for an awning is 2" wider than the width of the associated window. 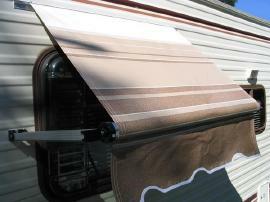 Awning rollers extend out 20" from the window.